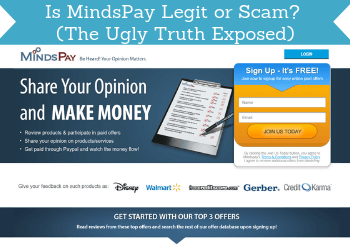 MindsPay claims it is a great site to share your opinion and get paid for it. But is MindsPay legit or just a scam to stay away from? Let me reveal right away that it is definitely not completely clear what you will get, and if you are not aware of this, you might end up wasting your time. In this MindsPay review, I will give you an inside look and show you all the details so you can see what the site really offers before you join. What is MindsPay and what does the site offer? At first sight, MindsPay looks like any other survey site. You are told with big letters on the front page of the website that you can share your opinion and get paid for it. At first, MindsPay looks like any other survey site – it is, however, not. Usually, this means that you can join and then start taking paid surveys on the site itself. This is, however, not quite how MindsPay works. So let’s go over what it really offers and how you can earn on the site, so you can see if it will be worth it for you. The first thing that concerned me a bit about MindsPay was already during the sign-up process. Already when you are filling out info about yourself to join, you are presented to other offers. You are told that you pre-qualified for some survey sites and they have made it possible for you to instantly register with up to 5 money making sites with just a click of your mouse. 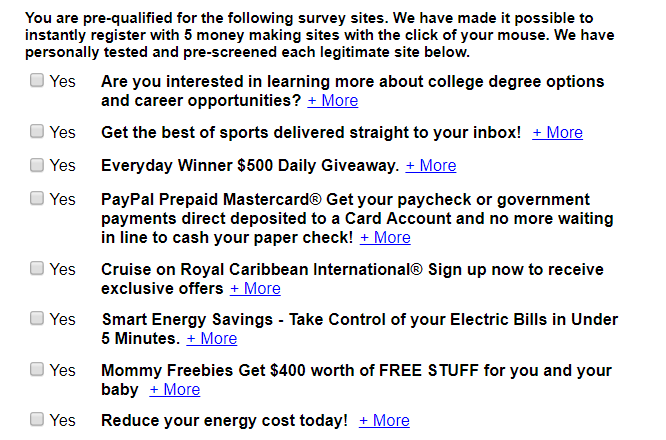 Examples of pre-qualified “survey” offers during the sign-up. The list of these offers and the statement that I pre-qualified for some surveys were suspicious for several reasons, in my opinion. First of all, they say that I am pre-qualified for these survey sites but the list is not showing me any surveys sites but all kind of other offers. Secondly, if you look at the list, it already then made me concerned about the overall quality of MindsPay. There is, for example, an offer where I can sign up to receive news about cruises in the Caribbean, I can get offers about how to reduce energy costs, and more. This has nothing to do with surveys and it is clear that they are just promoting offers they get paid to promote and that is not really focused on the user. In my opinion, this is not a transparent way of having a website. You join, and right away you are told you pre-qualify for surveys but you are actually just presented to random offers that have nothing to do with surveys. This was a big red flag for me right from the beginning. But I still decided to take a closer look, so let’s look into what you then find after you join. Once you have gone through several pages of promotional offers, you finally get to a members area where you can find an overview of the MindsPay earning methods. At first. it looks like MindsPay has a lot of opportunities. At first, it looks like it has a lot of opportunities. You can, for example, see a tab with offers for you, studies, bonus offers, and more. When you look closer, all the tabs are, however, more or less offering the same. It looks like there are a lot of surveys, for example, as you can find a long list that will make you excited at first if you like taking paid surveys. However, there are a couple of issues with this list and the other lists you find on MindsPay. It is not really paid surveys as such. It is just links to other survey sites. So when you click any of the links, you get to a description of the “offer” and you will see that you will not as such be able to take any surveys on MindsPay. When you click a survey, you get to a description that indicates what you really get. 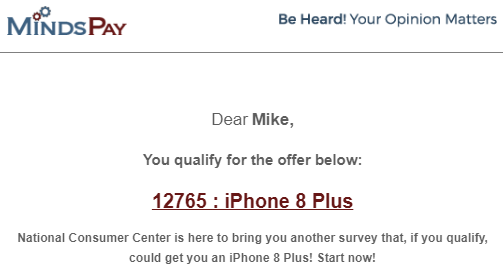 Above you can see an example of the description of a survey offer. When you click you can see what you really get, as it tells you that the point is for you to sign up for Mysurvey.com is this case. MindsPay gets paid to promote these offers and to get you to sign up. That is fair enough but I really do not like that they make it look like an actual survey site and then once you try to take the surveys, you find out you cannot. You just have to follow a link and go to another survey site to sign up and then you will be able to start taking surveys there. If the list of the survey sites was then amazing and gave you quality information to help you find the best sites for you, then it might make sense for me. The only info you can find is some rating stars and all the offers get 4 or 5 stars. But it does not say anything about why it has this rating, or who the sites might be for. In addition to this, the list has a lot of poor offers. I, for example, saw that they are promoting and encouraging you to join a site like Survey Voices. I have previously reviewed this site and it is just another site that promotes a lot of offers to you but even worse offers than MindsPay, in my opinion. So you do not even know for sure that the survey sites MindsPay promotes are worth it, and many of them are not, in my experience. And you get a lot of random offers that has nothing to do with paid surveys and it is difficult to completely figure out what some of the offers are about. In their defense, I must also say that I saw some good survey sites promoted on the site like for example YouGov. But it is more or less impossible to spot the good from the poor offers, and the survey offers from other offers unless you are very experienced. Therefore, MindsPay is, in my opinion, not transparent about what it offers and you need to know this before joining. Before you log in to MindsPay, you can see on the website that they say you can also get paid to read emails. How this works is that after you join, you will start receiving promotional emails quite often. Some of them are paid emails. If you click the link in the email, it will take you to the particular offer inside MindsPay. You will then get paid 3 cents to have clicked the link. Example of a paid email from MindsPay. Again, just be aware that the quality of these offers varies a lot. Some of them are, in my opinion, very poor and can also end up costing you quite a bit of money. But you can, of course, also just choose to click the link in the email, and then earn the 3 cents without taking the actual offer. It will, however, take a lot of clicks to make any real money. An additional way to earn on MindsPay is to invite friends to join. If they join through your invitation link, you will get 10% of their earnings when they cash out. Not in the way that they will get less paid out. But these 10% will be paid by MindsPay to thank you for referring someone else to the platform. However, before using this earning method, I will strongly encourage you to think about if this is a platform you really want to recommend to your friends? Do not do it just to try to earn a bit extra but only if you truly think it is worth recommending. Personally, I would have been very annoyed if a friend had recommended me to join MindsPay, and then I would find out it is just full of promotional offers and it is difficult to differentiate the good from the poor offers. As you can see, I am not impressed with what MindsPay offers. But it is possible to earn here if you do not mind following their promotional offers and clicking their email links. You, of course, need to know how you can then get your earnings out to see if it is a site for you or not. MindsPay offers one payout method and that is PayPal. This is a great payout method as it is an easy way to get your earnings in cash. But there are so many great PayPal survey sites, with so many more opportunities where you can actually take surveys on the sites and where all offers are high quality. So for a PayPal survey site, MindsPay is NOT very good, in my opinion. In fact, I would not even call it a survey site, as you cannot even take surveys on the site. Also, MindsPay has a very high payout threshold. You cannot get paid until you have earned $50. There is also a 30 waiting period after you have taken any offer until you can get your money. In addition to this, they only pay out on the 15th and the 30th of every month. This makes it very slow compared to many other sites. Honestly, you should, in my opinion, not expect big earning opportunities on MindsPay. Yes, you can get paid to take some of the offers it has, but it will take a lot of time to reach the payout threshold. Also, by taking the offers you might end up joining a lot of really poor offers as some of the ones promoted on MindsPay are VERY poor and a waste of time, in my opinion. There are some offers that pay quite well but in most cases, you have to actually pay yourself to take these. So make sure to read all the conditions before taking any offers or joining any survey sites MindsPay recommends. Overall, I am NOT impressed by the earning opportunities on MindsPay. If you decide to join MindsPay, it is good to know if you can use it on mobile or not. Being able to earn on the mobile makes it more flexible, as you can do it when it fits in during the day. The MindsPay website is fairly well optimized for mobile, so you can use it on mobile. It does not have an app, but you can use it through the browser on your mobile or tablet if you choose to join. At the moment, MindsPay is only available in the USA. There are, however, so many great survey sites in the USA, that it does not make much sense to spend time on MindsPay if you live here, in my opinion. The US is one of the countries with the most survey opportunities, so why spend time on a site where you are not sure about the quality of the offers and where you cannot even take any actual surveys? If you should need any support on MindsPay, it has a support section, after you log in. I do not know how quickly they respond and how helpful the support is, as I have not contacted them, and I am not planning to since it is a site I have decided to stay away from in the future. But if you decide to join, now at least you know there is a support option if you should need it. MindsPay is a legit site as you can earn on the site. In my opinion, it is however not really clear about what you get before you join. So let’s finish this review by summing up the pros and cons so you can get a better overview before deciding if it is a site you want to join or not. Overall, I really do not see much reason to join MindsPay. It is mostly just a promotional platform where they promote whatever pays them commissions, and you have to be aware not to end up joining some poor offers, in my opinion. 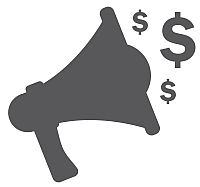 There are so many great survey and get-paid-to sites where you can take surveys on the sites, where you have many more opportunities, where the quality of the offers and surveys are always high, and where you can get paid a lot faster. So if you want to earn some extra cash online by taking surveys, I would instead recommend you to check out the top paying survey sites. All of these are high-quality sites that, in my experience, definitely are worth it in comparison to MindsPay. If you have any comments, questions, or have any experiences with MindsPay yourself, I would love to hear from you in a comment below. 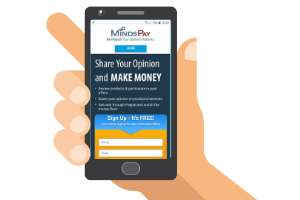 It is possible to earn on MindsPay, but NOT by taking surveys as you might think before joining. It is actually just promoting offers which includes survey sites. But you cannot take surveys on the site. Some of the offers it promotes are really poor, in my opinion, and you can end up wasting a lot of time if you are not aware of this. In addition to this, it has a very high payout threshold and it takes a long time for it to pay out. Therefore, I recommend you to join other sites instead.